These combinations come alive in the kitchen when it is time to use up the remaining vegetables from the refrigerator, and I often come up with interesting dishes. I got the chance to do that a while ago, having a single large green pepper and a large bunch of fresh kale leaves at my disposal. I had originally bought the kale leaves to make kale ‘chips’, baking them with some olive oil and spices until they turn real crisp. Some other time maybe. Anyway, I quickly whipped up a simple dinner with some couscous and a cooked kale salad, with some nice red wine for accompaniment. Bring to boil 2 cups of water with a pinch of salt and a tsp of olive oil. Add the couscous, stir for a few seconds and turn off the fire. Cover dish with a plate and set aside for 5 minutes for the couscous to finish cooking. Season with lemon juice when cooked. In a non stick pan on medium heat, add 3 tsp of olive oil, cayenne pepper, garlic and sauté for a few seconds. Add the green pepper, salt and pepper for seasoning and roast for 5 minutes, turning the peppers around occasionally until they are nicely roasted and crunchy. 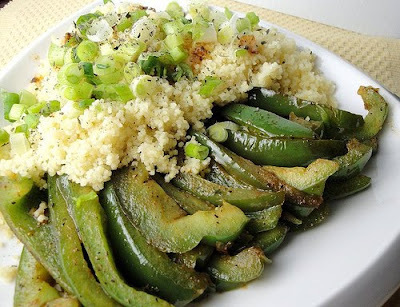 On a serving dish, make a bed of the green peppers and lay the couscous on top, garnished with the chopped scallions. For the kale salad, on a non stick pan on medium heat, add 3 tsp of olive oil, garlic, Asian red chili sauce, soy sauce and sauté until the water drains off. Add the kale leaves and ½ tsp salt and sauté for a few minutes, mixing everything well. Add the mustard and sauté the kale leaves until they are cooked but retain their crunch. Take off the fire, and let it cool down a bit. 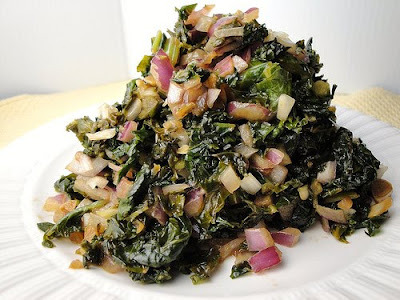 In a bowl, mix the cooked kale leaves with the raw red onions, balsamic vinegar, 1 tsp of olive oil and ½ tsp of salt. Serve along with the couscous. Delicious! The kale really comes alive in this salad, with the other ingredients adding a fantastic medley of flavors.